Despite turtle soup shops gracing every few corners in Hong Kong, the appeal of eating turtle is just about zero. Maybe it has something to do with the fact that I've had pet turtles throughout college. Who knows. 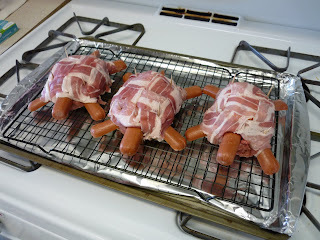 I still kind of wish it wasn't in a turtle shape (yes I am still somewhat turned off, even with the ultra-win combo of bacon, cheese, beef and hotdogs). 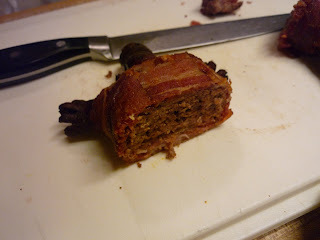 The creator calls this the "Bacon Cheese Turtleburger," originally made for his Super Bowl gathering. Sharp cheddar cheese, Hebrew National hotdogs, bacon and ground beef patty to be baked. Okay, now that looks less like a turtle and more like super delicious. Photos and description from Interwebs Randomness and Other Inspiring Tales and ThisIsWhyYoureFat.com. 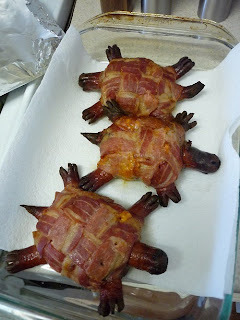 would rather eat real snapping turle....this looks GROSS! kill more turtle!